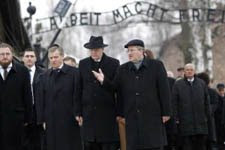 The memory of 6 million Jews murdered by the Nazis during World War II has been honored around the world on International Holocaust Remembrance Day and at Auschwitz, one of the largest death camps operated by Hitler's Nazis, the German President, Christian Wulff, was joined by Polish leaders to mark this day saying that Germany has learned the lessons of the past. Even though International Holocaust Remembrance Day was honored worldwide, there are still many world leaders who deny there ever was a Holocaust and some are even calling today for more Jews to be killed. As the world paused to remember the 6 million Jews killed during World War II on this year's Holocaust Remembrance Day, there are those calling for millions of Jews to be killed today, a precursor to the fulfillment of Bible prophecy. International Holocaust Remembrance Day saw many world leaders pause to honor the memory of the 6 million Jews killed during World War II at the hand of Hitler's Nazi forces. Many of these world leaders have said this Holocaust Remembrance Day should alert humankind of the reality of another holocaust if we do not learn from this dastardly event, an event that many say is the darkest chapter in history. But even as the world remembers the 6 million Jews murdered in the past one world leader, Iranian President Ahmadinejad, denies there was ever a holocaust and he is calling for the Jewish state of Israel to be wiped off the earth. This radical rhetoric from Ahmadinejad sets the stage for a future holocaust which is foretold in Bible prophecy. The ancient Jewish prophets wrote of a future holocaust of Jews during the Time of Jacob's Trouble as revealed in Jeremiah 30:7. Zechariah wrote 2500 years ago that two out of every three Jews will be killed during that time (Zechariah 13:8). John the Revelator foretold of a time when even evil angelic creatures will come to earth to try and eliminate all the Jews (Revelation 12:7-17). Stopping to honor the memory of 6 million Jews murdered by the Nazis is only a reminder of the worst holocaust to come. Bible prophecy will be fulfilled.